This Holiday season the beloved Dr. Seuss classic How the Grinch Stole Christmas is ushering in the season at the Children’s Theatre Company. Known for terrorizing the residents of Whoville every other day of the year, the Grinch has had enough of the holiday cheer and decides to bring his reign of terror to everyone’s favorite time of year. With his dog Max in tow, the Grinch takes it upon himself take away everyone’s Christmas cheer. But a chance run in with a frightened Cindy Lou while stealing her family’s Christmas, makes the Grinch re-evaluate his decision to take down Christmas. Lead by the incomparable Reed Sigmund as the Grinch, CTC’s production is the perfect night of theatre for everyone. At just shy of two hours, this show is the perfect opportunity to introduce the little ones not only to theatre, but to the marvelous world of Dr. Seuss. Don’t have any kids? No problem as with every CTC production adults will feel right at home re-living a favorite childhood story. Brandon Brooks has a star turn as young Max, the Grinch’s dog. This production marks Brooks eleventh and last production with CTC as noted in the show’s program. The young actor brings a spunky take on Max full of energy and he is the perfect pairing with Reed Sigmund’s grumpy Grinch. His ability to take charge of the physical comedy demands of this role is beyond his years. Brooks has a bright future in theatre. Tom Butsch’s set design is classic Dr. Seuss. The design and coloring feels like a page taken right out of a book with set pieces resembling the book’s illustrations. Combined with gorgeous costume designs by David Kay Mickelsen, it really feels like you are watching the book come to life. Director Peter C. Brosius’ use of scrims for staging this production is fantastic. This staging allows for amazing quick changes of the set and avoids the delays often seen when scenery needs to move for the next scene. The special effects of the flying sleigh is sure to bring smiles and amazement to the little ones in the audience. If you’re looking for a family friendly holiday excursion, that is sure to delight the whole family, How the Grinch Stole Christmas needs to be out the top of your list. Not only can you introduce a new generation to Dr. Seuss, but you can enjoy a childhood favorite through the eyes of a child. 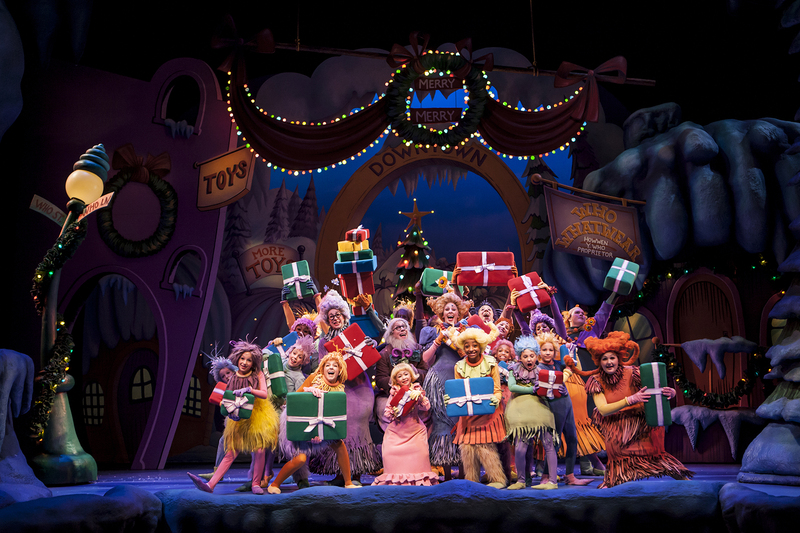 How the Grinch Stole Christmas runs through January 4, 2015. For more information on the show, visit the Children’s Theatre Company’s website.